As darkness falls, demon corelings rise — multitudes and giants, from fire, wood, and rock, hungry for human flesh. After centuries, humans dwindle, protective wards forgotten. Three young survivors of demon attacks, Arlen, Leesha, and Rojer, dare to fight back. 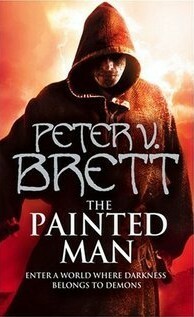 This is another book with a different title for different countries; The Painted Man is also known as The Warded Man. 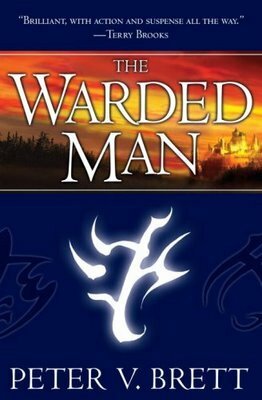 Not a huge difference and both factually correct but I think I prefer The Warded Man. When I read this book in 2013, it was my favourite book of the year. It is the first book in Brett's Demon Cycle series. As I am writing this post now, I would have to say that The Demon Cycle series is my all time favourite Fantasy series. I just love all the demons! There was loads of action in this book making it a very entertaining read which gripped me from the get go. At night fall, demons rise from the earth burning crops and houses, killing people and animals, but most of all putting fear in to people which keeps them prisoners in the own homes and villages. The only thing that keeps them safe is magic - they ward their houses to stop the demons entering. There are different types of demons; fire, wind, wood, sand, water and stone. This book tells the story of three people living in these scary times; Arlen, Leesha and Rojer. All three have found themselves in difficult circumstances and all have survived a coreling (demon) attack as a child. They are all three children at the start of the book, coming of age and are middling their twenties as the book closes. I really liked Arlen and Leesha as characters but my favourite of all was Hag Bruna, Leesha's mentor, who had me laugh out loud on several occasions. The third person narrative moves from one character to the next telling their story until the three characters cross paths. I honestly can't believe this is Peter V. Brett's first book! I devoured this book and loved everything about it. I have since read the second book, The Desert Spear, which was fantastic and I have the third book, The Daylight War, to read in the next month or so. I read all three late last year and was amazed that I got hooked since I am not that big into this type of fantasy, but I love Arlen and the desert scenes were so captivating. I like that he put a rather unique spin on a weary subject matter and made it his own. Glad you enjoyed the series. I read the second book a few weeks back and I'll post a review soon. I have the third one lined up for September. I've been trying to space them out so I'm not left wanting for the fourth instalment. I too love Arlene and all the different demons.